Hello! I know it has been a while since I’ve updated on my experiences as an IWM in Chimbote and in San Antonio. 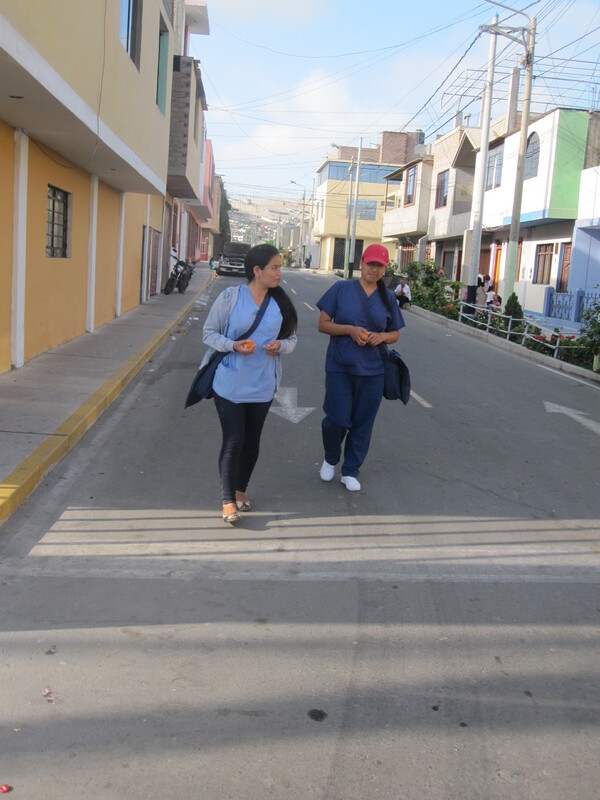 Well I just want to take this time to thank all of the friends, co-workers, sisters, patients, and summer program participants I met during my time in Peru and at Inner City Development. It is long overdue. I learned so much about life and love during my time spent in both places. I will forever be grateful for the gifts you all shared with me. You see the funny thing about this whole experience, is that from the beginning, I was told about how I was going to sacrifice a lot to go over there. Really in my eyes, I gained much more than I sacrificed. I gained friendships, I gained this sense of community that still follows me, I gained a viewpoint of the world that I needed. So again, I will take with me, what I gained and the people I met, for the rest of my life. So what is life like now that I am back home? I was very excited to see my family and friends upon my arrival. That was the hardest part of this. So I am happy to be reunited with them. The thing I was also told about becoming a missionary was that it was going to be hard transitioning from your time serving back to your old reality. At first, I was just excited to be reunited with my loved ones. Then, I could not stop talking about all my new friends I made over there, and attempting to share my experiences. I did continue to serve as a missionary in San Antonio for my last two months. So I still was not really back to my reality, my old life. I helped with the summer program at Inner City Development. I was able to meet some amazing people doing amazing work in San Antonio. It was a quick two months, but I truly enjoyed my time I got at ICD. 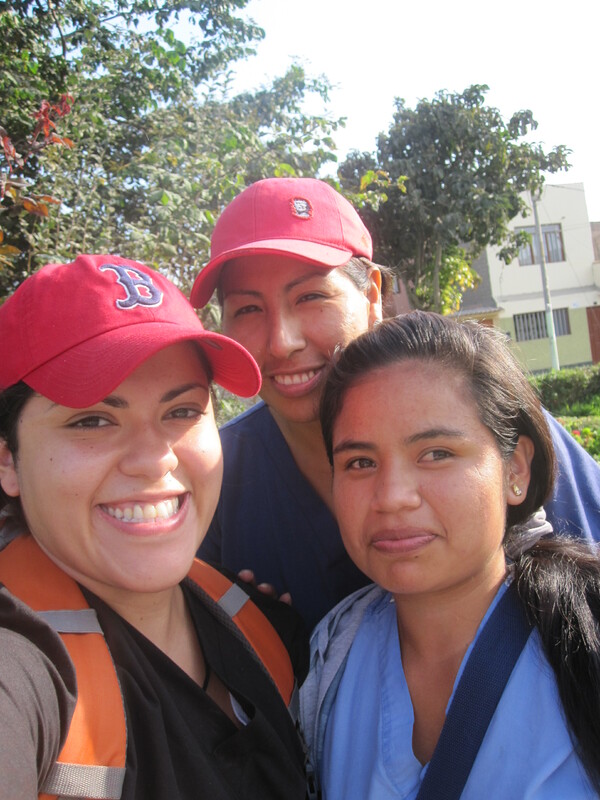 These two volunteer experiences, both in Peru and in San Antonio, gave my life a purpose I hadn’t really ever felt. This past year showed me the importance of mindfulness and living your life on a day to day basis and being mindful of your present moments. I had always struggled with this, because my escape from the present was always to think of how great I was going to make the future. Well, the problem is we don’t live in the future, we live in the now. The changes in the world happen in the present. Anyway, back to my story. As I finished my service, I began my post-graduate courses, the job hunt, and looking for my new home. All of this, again, was a cushion from really feeling and digesting my experience. I jumped into a new job, my course work, and decorating a new apartment. I love what I am studying and what I am learning on this new job.I am very grateful for it all. However, now that I am not jumping into something new, and my reality is stable again, I am now beginning to feel the after shock of everything. I miss that purpose I felt on a daily basis. I miss my life in Peru. I miss the mindful life I was leading. I miss the deep, intense conversations about real issues. I miss the adventure of meeting new people from a different walk of life. See this is what I think they tried warning me about. Being a part of something so much bigger than yourself, and then not. I know I am still somewhat a part of something bigger than just me, but it’s not as raw as the missions I served. All of this being said, I am in a transition part of my life. I can choose to be sad, I can choose to going back to living life not so mindful. Or I can take what I know now and continue living a mindful life. Bring the deep conversations over here. Raise awareness for the issues I witnessed. Keep the friendships I have made. I can try and lead my daily life with a purpose, in knowing I am trying to make my small impact in this world. This is my solace after this amazing year. It doesn’t have to stop. Just because I am not doing something so raw and apparent, doesn’t have to make life now feel like it has less purpose. This is for those of you, that feel you are in a point in your life where you are transitioning from something that made you happy, to a new reality. Whatever it may be, change can be good. My words of advice, be mindful. Change may not hit you immediately, but it will hit you. Allow yourself time, and patience to get to a place in your new life where you feel that purpose again. I had so much transition this year, from graduating from university, to becoming a missionary, to moving abroad, to leaving my life abroad, to falling in love, to trying to “adult”. It wasn’t all rainbows in butterflies, but it is shaping me into a better person. We all deserve to lead lives we feel proud of and full of purpose. The secret is, we need to allow ourselves that opportunity. The choices you make do affect who you are, and affect those you around you. So be mindful of yourself and your neighbor. 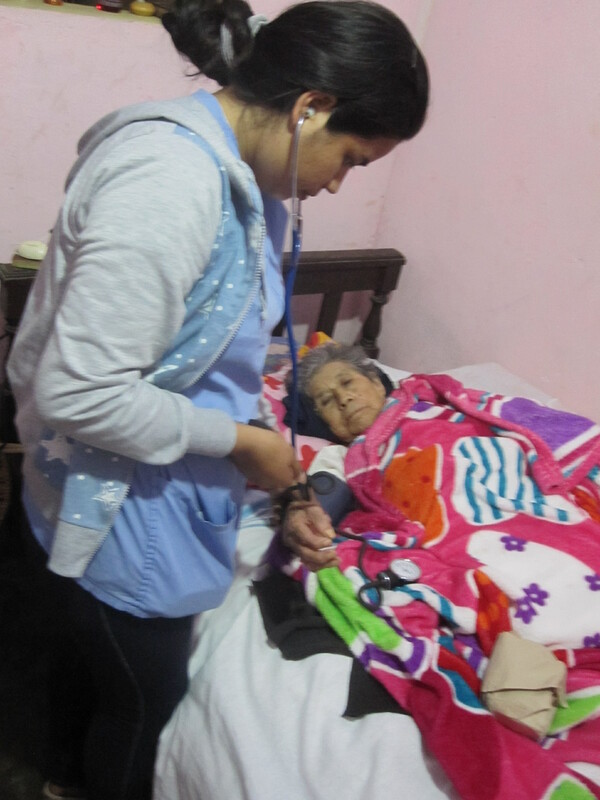 Thank you to the Incarnate Word Missionary Program for allowing me to be a part of their mission at Santiago Hospice in Chimbote, Peru and in Inner City Development in San Antonio, Texas. Thank you to all the amazing people I worked with and all the beautiful friendships I developed. Thank you to all to the amazing housemates I had both in Peru and in San Antonio. Thank you to the support I received from my family and loved ones. Thank you to Women’s Global Connection for your connection into this program. My past few months at Hospice I have learned about the life of the caregiver. The endless work that is put into taking care of a sick family member, or loved one. The pains and aches of nurses and nurses aids, as they care for patients. The aches of a doctor, who tries to manage her patient’s pain. End of life is a reality we all face. The part that we do not really talk about, are those who will be tending to us in our final days, or through our sickness. They are the bedside angels, dealing with your illness, the sadness, and the reality of your illness. Family members who bear the responsibility of caregiver, take on everything from the physical difficulties of caring for an ill family member, to the emotionally strain of dealing with the suffering of an ill family member. I have seen a variety of different types of family members, and different levels of involvement and interaction with the patient. I have seen mothers and fathers who sit day in and day out tending to their disabled children. They put their hand in every step of the way aiding us in our work, and asking questions. I have seen a husband who wakes up every day to give his wife breakfast, change her clothes, and clean up after her, because she can no longer tend to herself. I have seen daughters and sons tend to their elderly parents as, the roles in their relationship seem to reverse. The children become the parents, feeding, changing diapers, and treating wounds of their ill parents. I have seen elderly patients who are couples and both need care giving, but still seem to love and care for each other as best as they can. I have seen grandchildren caring for their grandparents, and trying their hardest to keep a balance in their life. I have also seen patients who are not so fortunate to have these loved ones in their life. Those are the patients that this hospice was founded upon. Those who were abandoned and deserved peace and love in their death, just as we all do. For the healthcare providers involved in palliative care, I have witnessed and experienced the load they carry. All of the nurses and nurses aids who work in the hospice, they become like a family to our patients. They are the ones celebrating birthdays, having conversations, feeding the patients, bathing the patients, and treating the patients, everyday. For those of us who go out into the community as home health visits, we build similar relationships, but only for a few days out of the week. The doctor cares for all of these patients, and tries her best to manage their pain, and treat their condition. After many conversations with our doctor, one statement has stuck with me. She told me that after every patient passes she feels a knot in her stomach and does get sad, because she studied medicine to keep people living. That is a hard truth, but what the doctor is doing, is giving these patients a peaceful and dignified life as they approach their last days. I have also seen the important role of the psychologist in caring for the patient and their family through these difficult times. The psychologist helps with the emotional stress involved in care giving, the dealing with death, and all of the other mental strains involved with palliative care. All of these providers build a relationship with the patient, that at times has to have a wall to keep from getting too attached. That is the burden in balance, that with some patients, can be hard to achieve. I have witnessed death a lot over these past few months. Specifically, with one patient I witnessed the patient enter hospice and I was there during his last breath. There was something about this patient that made me feel a stonger connection, than with my other patients. I think it was the suffering I saw in his eyes, and the humility he had as we treated him. His passing was harder for me to cope with, than that of previous patients. I dealt with this loss knowing that he was no longer suffering, and he was finally at peace. I also had comfort in understanding he had been given care and love from his family, my co-workers, and myself. As I am living my own experience here at Santiago Apostle Hospice, I have also gotten phone calls from back home with similar topics. From friends to family who are having to take the role of caregiver, to those who are considering hospice for their loved ones. Through all of this, the common theme I have witnessed amongst all this suffering, is love. These family members that have stepped up to tend to their loved ones, are showing love. The healthcare providers who work with a mission to tend to these patients and give them peace and dignity, are showing love. My loved ones back home, who are caring for their family members, are showing love. This year is the year of mercy, and for me I am witnessing merciful love. I am learning my best to give this love. This post is dedicated to all of you caregivers out there. Not only the caregivers in end of life, but for those caring for someone, all the mothers, fathers, sisters, brothers, daughters, sons, grandchildren, neighbors, husbands, wives, doctors, nurses, any healthcare providers, friends, uncles, aunts, and loved ones. You all show merciful love, that is truly beautiful and something the world needs more of. Thank you to my mother, father, and sister who have taken their part in caring for me. Now I don’t want you to think that this entire 3 months that I have been here, I have only learned about amazing Peruvian food. This post is not only about the food, but the lessons I’ve learned from the sharing of a meal. From my orientation, food was a topic brought up. 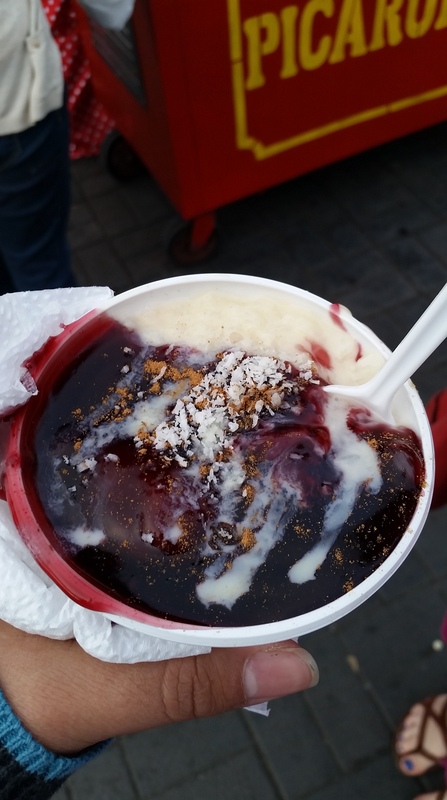 They told us to allow time for our body’s to adjust to the cuisine in Peru and to be careful where we ate. I lived religiously by these rules and avoided any food that did not seem would sit with me well. Then one day a beautiful thing happened. I had my first plate of ceviche! 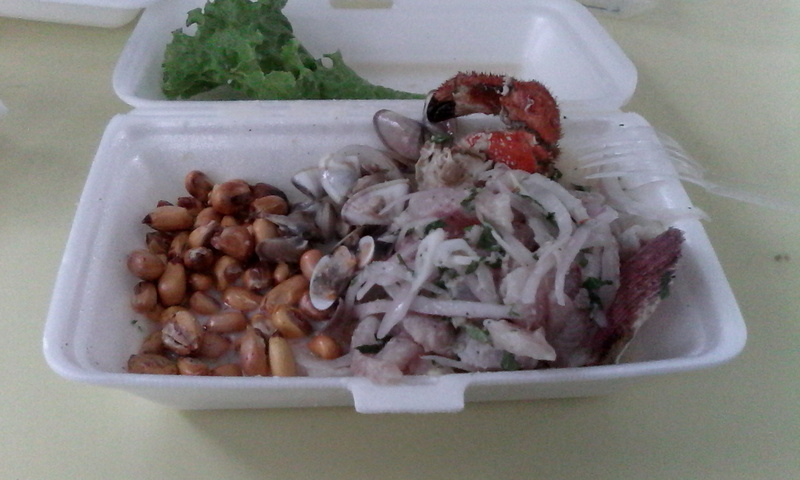 Now for those of you who have never had ceviche from Peru, then well you are missing some part of heaven. It was nothing like any ceviche I had tried back home. It can be prepared with different types of fish and sauces! The most common I have had is with clams, crab, and fish. All of this is raw and cooked in lime juice. The picante and sauce is what makes the ceviche. There are variations of sauce but the main just is it is a lime flavored sauce with rocotto (red chile), onion, and a few other additions. 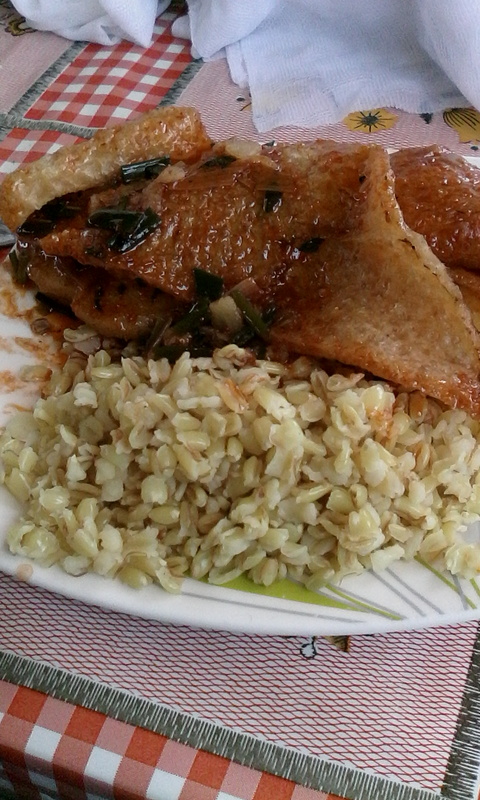 They have two sides of sweet potato and concha (fried corn kernels). Sorry, I can get a little distracted when I am thinking ceviche. After this first plate of ceviche, and not getting sick, I felt invincible. I soon began enjoying various Peruvian plates, gaining some weight, and being completely happy. That was the case until one Friday night I woke up at 3 AM and emptied the entire contents of my stomach. I had gotten food poisoning. I recuperated a few days later. This experience could have ruined the way I felt about the food here, but that’s where lesson one came in. Do not let one bad experience, ruin your entire concept of something. I now became more cautious, but still enjoy these foods. The other side of the story is that from the very beginning, my co workers were very concerned about what I was eating for breakfast, lunch, and dinner. Flor, the psychologist, soon then came to my house and made me 3 different Peruvian dishes. Then, my co-worker Cleide began bringing me breakfast. Dr. Katy, also brought me breakfast. The team even all got together to make a deal to take turns with bringing me home for lunch. I was soon overwhelmed, and felt very grateful and in gratitude for this. I had never really experienced something this intense. I am used to always being fed, I come from a Mexican family. We know how to eat and share. This was just on a different level. Then, I learned a beautiful lesson, food can bring you closer to people and help you understand who they are. These co-workers of mine were doing more than just sharing food, they were sharing their culture and their lives with me. I have had the blessing of being invited over to share meals and share stories. 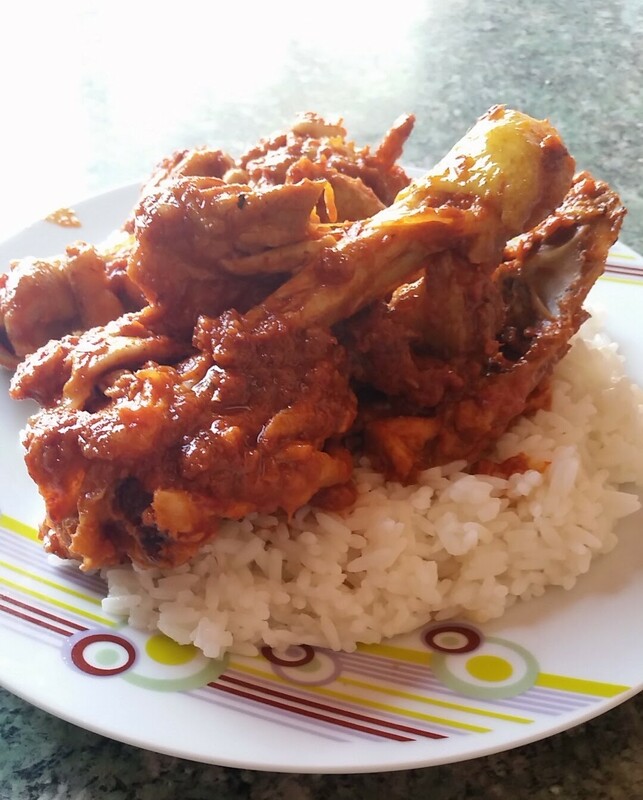 I have gotten the experience to learn how to prepare some of this food. There are 3 different areas in Peru, the coast, the jungle, and the mountains. Each one of these places have different cuisines. 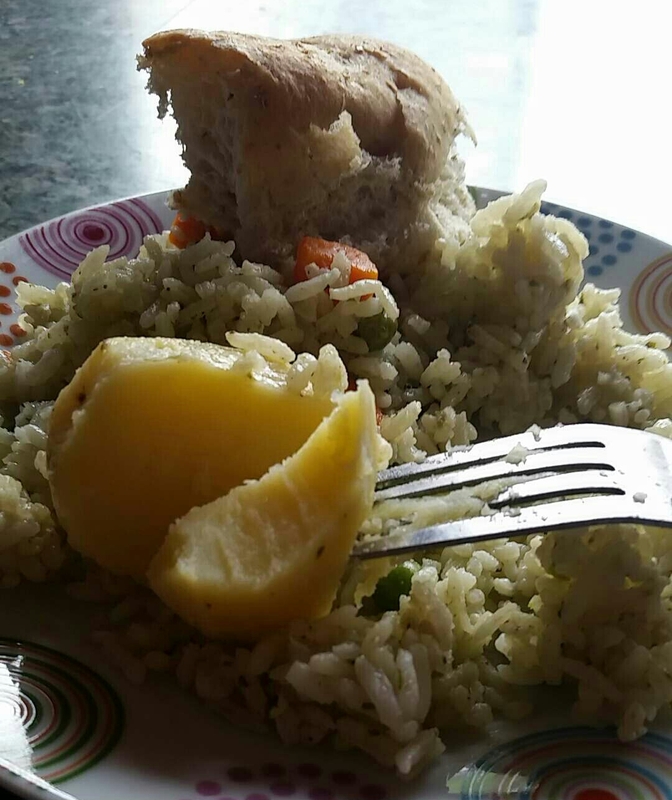 Peru is rich in their cuisine, and this cuisine for me has been like taking a Peruvian cultural class. I have learned what foods are made where and why. Lastly, these people are taking a part of their food and sharing. A basic concept, but a hard one for many. There is no ownership or territorial feeling with their food. If its there, and someone needs to eat they will lessen their portion and share. It’s something that is natural to these new friends I have made. So, aside from the mission I am working on in the Hospice, I learn lessons outside of the medical arena. I learn that food is essential to life. It is a way we can express our cultures and share cultures with one another. It is a way for happiness to come from different people coming together. It not only feeds our physical bodies, but our souls. Real food, unprocessed and made from scratch contains the nutrients to fuel a healthy body, and stories that can be passed from one person to another. I learned that people, no matter what situation they may be in or the life they lead, can surprise you. They can open themselves to acts of kindness that can truly make an impact on your life. The next time someone invites you over for a meal, remember they are doing more than breaking bread, they are sharing apart of themselves with you. They are feeding you in more ways than one. Never shy from breaking bread with someone. In the middle of my second week of hospice I was asked by on of my co-workers, Paty, what was the most influential lesson I had learned over the past 2 weeks? Immediately, my answer was the sense of team work and community that I had observed and been a part of. On my first day, I walked into the meeting room of the hospice and was welcomed with open arms by the “equipo” who goes out into the community. They begin every work day with a prayer, psalm, and petitions. After, they discuss the patients they will be seeing that day and any problems they encountered during their previous visits. 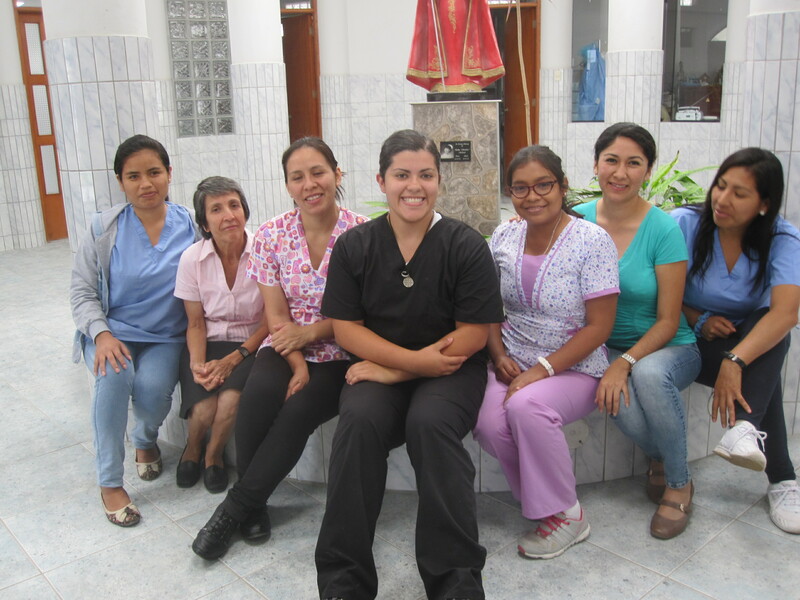 It is a team of five including an electric psychologist, Dr.Flor, kind doctor, Dr. Katherine, two hard-working technicians, Paty and Gloria, and myself. I admire the way this team of medical associates work hand in hand. They all have an input on each case. They place the problems on the table for the whole group to work together. It isn’t the type of team that works vertically, but rather horizontally. There is respect and accountability in each individual’s role in the group. patients have chronic illnesses, they deserve to have tender care because they are human. It is that basic. A right to have dignity and have some sense of peace in the worst of health conditions, is a basic right we all should have. Finally, once our rounds in the community are done we head back to the hospice help with the admitted patients. Usually, this means helping feed the patients because we arrive right before lunch. Here is the last part of the network. The staff that works inside the hospice give these more severely ill patients care and dignity, as well. The work doesn’t only come from the medical staff, but the clerical staff are part of the team. They help ensure schedules are made, the moneys are accounted for, families are counseled, the hospice is clean, and the hospice is secure. This hospice can only run like a well oiled machine if everyone plays their part. Not only does everyone play their part, but everyone works together. This hospice team includes the medical staff, the patients, the clerical staff, and the families of the patients. So this team is a community in itself. If anything from this team, I have learned the importance of the common good and human dignity. This team is made up of individuals who work and sacrifice for the common good of the patients. 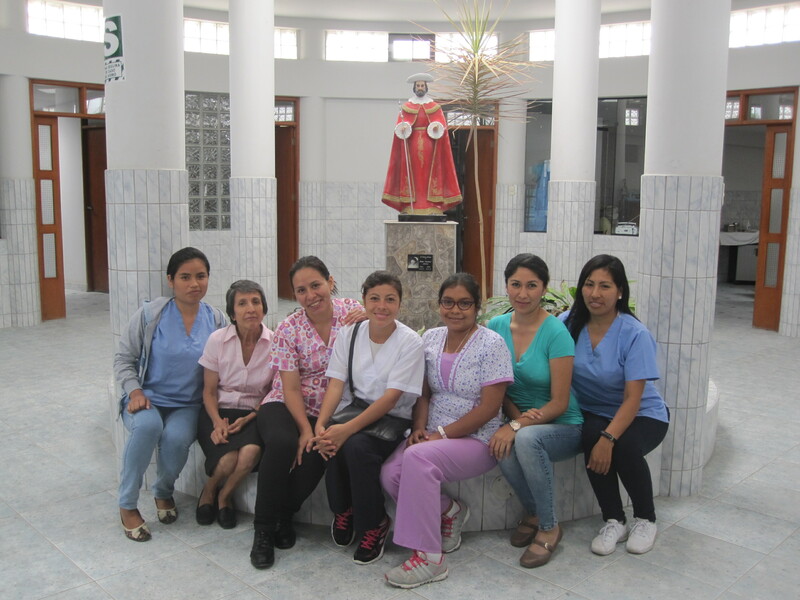 They not only treat these patients with dignity, but each other with dignity. Each individual has a role and say that is respected by the team. These patients are either chronically or terminally ill, and deserve the care they receive because they deserve to have dignity in their illness. We all have a right to dignity at our basic core. I am thankful to be working in the only hospice in all of South America, and even more thankful to have been given the opportunity to work with such a strong team and welcoming community. After about 4 months of anticipation, 1 week of orientation, 12 hours flying, and a 7 hour night bus I am finally in Chimbote, Peru! So let me tell you a little bit about my journey to becoming an Incarnate Word Missionary (IWM). Nearing the end of my undergraduate career, I was at a crossroads between who I was and what it was that I wanted to do for my next step. Then, just as I was about to make my decision, God appeared. I was presented the opportunity to become an IWM through one of the organizations I had worked with, Women’s Global Connection. I had previously considered doing other volunteer organizations, but never really felt as right as this program. I finally felt like I had been given an answer. Myers Briggs Tests always help! So here I am, 1 day away from starting work at the hospice here, and for those other questions. I am getting comfortable the longer I am here, and I am happy in the sense that I know I am where I need to be at the moment. This journey is not a self proclaimed journey about me being a savior by any means. This journey at its rawest form is about people learning from one another, and exchanging love.